THIS THREAD CONTAINS INFORMATION ABOUT THE PINION SEAL RECALL. ALSO TO ANSWER QUESTIONS SPECIFIC TO THE RECALL. Questions can be asked in these other threads. Answers will be imported to this thread for reference. The previous announced upcoming recall to replace the rear differential pinion seal was issued today, February 1 2008. The actual dealership bulletin doesn't really contain any information that wasn't already available. This is basically letter that will be received by the certain vehicles involved. The one you receive will be single vehicle (Solstice) specific. The mailings are scheduled to begin February 8th. Site members have already reported receiving them as early as February 11th. General Motors has decided that a defect that relates to motor vehicle safety exists in certain 2005-2007 model year Cadillac CTS, CTS-V, SRX, STS; 2006-2007 model year Cadillac STS V; 2007 model year Daewoo G2X and Opel GT; 2006-2007 model year Pontiac Solstice; and 2007 model year Saturn SKY vehicles. As a result, GM is conducting a safety recall. We apologize for this inconvenience. However, we are concerned about your safety and continued satisfaction with our products. • Your vehicle is involved in safety recall 07204. • Schedule an appointment with your GM dealer/retailer. • This service will be performed for you at no charge. Why is your vehicle being recalled? The drive axle differential seal (two on all-wheel drive vehicles) may leak because it does not meet GM's specifications. If a seal is leaking, there will be fluid on the ground where the vehicle is parked. If enough fluid leaks, the differential will become noisier because of reduced lubrication. After about two-thirds of the differential fluid is lost, the bearings may no longer be lubricated and may start to overheat. 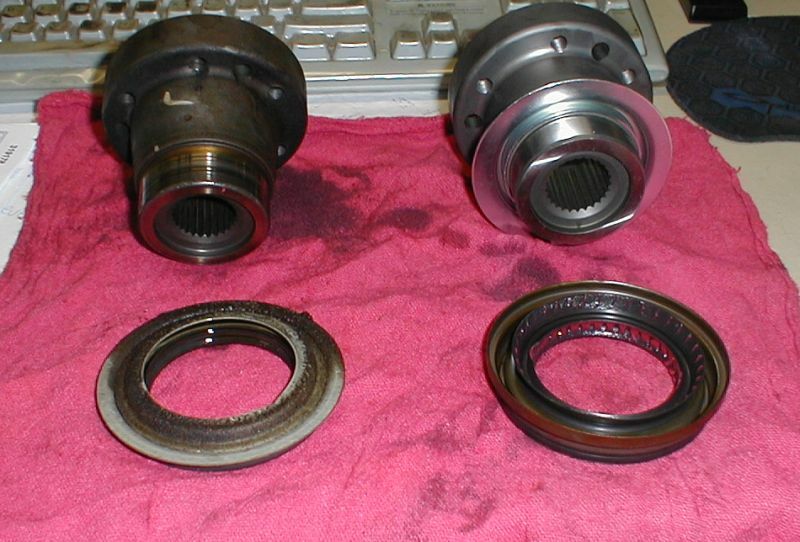 Damage to the bearings and other differential components could then occur. Damaged bearings will create noise that may be heard by the vehicle occupants. If the vehicle is not repaired and damage progresses, three conditions can occur: (1) When the vehicle is stopped and shifted to reverse, the differential may jam and prevent vehicle movement; (2) the damage can cause drag that will feel like the brake is applied; or (3) the differential could jam and lock the drive wheels while the vehicle is in motion. If (3) occurs, the driver may not be able to control the vehicle and a crash could occur without warning. Your GM dealer/retailer will install a new drive axle differential seal (two on all-wheel drive vehicles). This service will be performed for you at no charge. Because of service scheduling requirements, it is likely that your dealer/retailer will need your vehicle longer than the actual service correction time of approximately 1 hour and 20 minutes to 2 hours and 50 minutes. If your vehicle is within the New Vehicle Limited Warranty your dealer/retailer may provide you with shuttle service or some other form of courtesy transportation while your vehicle is at the dealership/facility for this repair. Please refer to your Owner’s Manual and your dealer/retailer for details on courtesy transportation. You should contact your GM dealer/retailer to arrange a service appointment as soon as possible. Bring the enclosed customer reply form with you when you visit your dealer/retailer. The form identifies the repairs required. If you no longer own this vehicle, please let us know by completing the form and mailing it back to us. Did you already pay for this repair? The enclosed form explains what reimbursement is available and how to request reimbursement if you have paid for repairs for the recall condition. If after contacting your dealer/retailer and the Customer Assistance Center, you are still not satisfied we have done our best to remedy this condition without charge and within a reasonable time, you may wish to write the Administrator, National Highway Traffic Safety Administration, 1200 New Jersey Avenue, SE, Washington DC 20590, or call the toll-free Vehicle Safety Hotline at 1.888.327.4236 (TTY 1.800.424.9153), or go to Safercar.gov. Federal regulation requires that any vehicle lessor receiving this recall notice must forward a copy of this notice to the lessee within ten days. Much confussion was caused by the reimbursement information in the DOT/NHTSA filings by GM. As the process doesn't involve dealerships, no information about it is included in the recall bulletin issued to dealerships. Once on is received by a site member, if they post it, it will be incorporated into this thread. Important: Dealers/retailers are to confirm vehicle eligibility prior to beginning repairs by using the system(s) below. Not all vehicles within the above breakpoints may be involved. The VINS can be checked by dealerships effective February 1st, in GMVIS. There was speculation about what "certain" would mean when the recall first came to light in December. Have checked VINs for base 2007 Solstices with both transmissions and with/without LSD. Found all four VINs were included. Part of December's speculation was that the announce recall totals appeared "light" when comapred to productions totals, as shown by achieftain's post. Well now that the recall is officially announced the effected vehicle population is 311,071. Higher than December's 275,936. So that should answer that question. As site members have their cars checked out for service, maybe a pattern will develop. The system would be capable of excluding vehicles that may have already had the seal kit installed, or a 2008 spec rear differential. So "certain" probably means the previously repaired cars and cars that may not be eligible due to having been totalled or such, are the excluded ones.. The part(s) required to complete the recall, turns out to be the seal kit that replaced the previous seal in early December of 2007. This kit included a revised seal, a pinion yoke and pinion nut. These kits are subject to availability in the GM system. Many dealerships may have already ordered them, or will with the release of the recall bulletin. Saturn Retailers are being receiving a pre-shipment of seal kits. Not any detail in the recall bulletin as to the procedure. It refers dealershisp to the appropriate procedures in the service manuals. Important: When replacing the pinion seal, make sure that the pinion bore is free of excess fluid that could get trapped before the yoke is installed. Install the new seal and yoke promptly, before excess fluid seeps into the area. It may be necessary to drain some or all of the axle fluid to assure that the pinion bore remains free of fluid during seal installation. This should prevent the lube from being trapped behind the dust shield. Important: DO NOT reuse the flange and nut as instructed in the service procedure in SI. Use the new flange and nut provided in the kit. 1. Remove the pinion seal. Refer to the appropriate pinion replacement procedure in SI. 2. Replace the pinion seal. Refer to the appropriate pinion seal replacement procedure in SI. February 15th revisions to the recall procedures have added new opening steps. Dealerships are to check a vehicles warranty service hsitory to see if the rear differential has been replaced, If so they are to record the part number used in the replacement. They then compare this number to a list of rear differentials that will not need the recall done. These are more recent differentials built most likely built with the 2008 spec seal in place. This came up for discussion also back in December. While an owner is not required to have the recall done, dealerships are required to do it. Here is the wording (I have added the bold for the last paragraph. All unsold new vehicles in dealers' possession and subject to this recall must be held and inspected/repaired per the service procedure of this recall bulletin before customers take possession of these vehicles. Dealers are to service all vehicles subject to this recall at no charge to customers, regardless of mileage, age of vehicle, or ownership, from this time forward. Customers who have recently purchased vehicles sold from your vehicle inventory, and for which there is no customer information indicated on the dealer listing, are to be contacted by the dealer. Arrangements are to be made to make the required correction according to the instructions contained in this bulletin. A copy of the customer letter is provided in this bulletin for your use in contacting customers. In summary, whenever a vehicle subject to this recall enters your vehicle inventory, or is in your dealership for service in the future, you must take the steps necessary to be sure the recall correction has been made before selling or releasing the vehicle. Questions can be asked in the other threads. Answers will be imported to this thread for reference. Last edited by Small Dealer; 06-21-2008 at 08:01 AM. Location: Murrells Inlet, SC "A quaint little drinking village with a fishing problem"
My Solstice is an early 2007 with nearly 10,000 miles. It has never leaked. Does anyone know if the recall seal is of a new design or should I just wait and see if mine ever starts leaking? A positive attitude may not solve all your problems but it will annoy enough people to make it worthwhile. My Solstice is an early 2007 with nearly 10,000 miles. It has never leaked. Does anyone know if the recall seal is of a new design or should I just wait and see if mine ever starts leaking? The seal in the parts kit is a redesigned seal. When you bring your car into a dealership is your choice. Dealerships are instructed to perform the recall on any vehicle requiring it, regarless of age and mileage. They are though, required to perform the recall on any car needing it that is in their inventory or even in for other services. Just got my letter yesterday and I was wondering is there a time frame on when the car needs to be in by? If so how long do I have? Mods: Fujita CAI, Stubbie Attenna, Lil Chromies, Third Brake Overlay, 35% Tint. Solo Headers, Solo Exhaust. Is there a time limit on getting the recall done? Some of these are taken from the other threads. What is the warranty on a recall repair? The warranty on a recall repair part is the same as any other GM replacement part. Which ever is longest, the balance of the original Bumper-to-Bumper Limited Warranty (36 months/36,000 miles for 2006s)/Limited Powertrain Warranty (60 months/100,000 miles for 2007s) or 12 months/12,000 miles. Notice: In the event a part previously installed for a recall, the dealer is to determine if warranty coverage applies (i.e., new vehicle warranty or parts replacement warranty). If the new vehicle warranty or parts replacement warranty has expired, the customer is responsible for the cost of the replacement part and the corresponding labor. Are there special tools required? The most important of them is the Seal Installer. Owners should request that the dealership make sure that they have and use the Installer. Specific language has been added to the revised recall procedures pointing out the importance of using the tools. We are calling this the MomsSol rule #1. For dealerships that have lost or broken any of the required tools, there is current a wait for replacements. Dealerships is some areas have had to borrow tools from near by dealerships. Another special tool that should be used, is the J 43625 Lift Pad Adapter, or "pucks" as some on site refer to them. These attach to the underside of the Solstice at the rear lift points. How long might the repair take? The labor allowance for the Kappas is 2 hours base time, with an additional 1.6 hours for cars with the driveline support bracket (Manual Transmisison 2007 GXPs and many base 2007s). Does the fluid have to be changed? It is one of the areas of the recall and procedure that is unclear. The recall, as has past service information, talks about the importance of keeping the pinion bore free of fluid. Fluid that could give the perception of a repeat failure. It does not require, or list it, as one of the steps in performing the seal replacement. The parts information lists the required fluid and additive, but the payment section makes no additional reference to it. But, it does go a one step beyond though and states "It may be necessary to drain some or all of the axle fluid...". It would appear it is up to the dealership or their tech, on what to do. With out further guidence from GM, or dealerships getting claims bounced for excessive parts allowances, my recommendation would be to request that the procedure be done with a full drain and refill. Also request that they read the latest service procedures in the electronic version of the service manual, use all the proper special service tools, lift it carefully, and use the additive if required. Subsequent versions of the recall bulleting have dropped the fluid caution information. So it appears this is why dealerships are backing away from doing a complete fluid drain and refill during the recall procedure. Still best to request it and see what your dealership says. Does the recall need to be done on my new differential? This needs to be checked out before the recall is done. If a Solstice has had a replacement differential that is 2008 design, as several have posted over the last few months, it cannot use the the redesigned pinion seal in the recall kits. This is because of seal dimensional differences. Revised recall procedures (February 15th) address this subject. Dealerships are to check a vehicle's warranty history to see if the differential has been replaced. If so, they are to check the part number of the differential used against a list of part numbers in the recall bulletin. If the replacement differential is on that list, the recall will not need to be done. Additional identification information can be found in the revised seal replacement TSB issued in early December (before the recall) to dealerships. Does the recall need to be done on my new rear seal? Little more difficult of a question to answer. If a rear pinion seal was replaced with the seal kit, it would make sense that it did not need to be done again. This would require the use of the kit after it was released as a replacement for the seal in early December 2007. Warranty history, as well as a visual inspection, should confirm the presence of the revised seal/kit. Do I have to have the recall done? There is no requirement that an owner have a Product Safety recall performed on their vehicle. As mentioned above there is a requirement that a dealership perform the recall on any car that comes into the dealership for service. There have been posts on site from memebers urging that everyone get the recall done. They point to their situations be it rear differential failures or finding out there have been leaks without being noticed. Each person must make the choice that is right for themselves. It would be much different if this was an Product Emissions recall. Here is two sections from a owner notification letter on an Emissions recall. Emission Law Information: In order to ensure your full protection under the emission warranty made applicable to your 2008 model year Pontiac Torrent by Federal Law, and your right to participate in future recalls, it is recommended that you have your 2008 model year Pontiac Torrent serviced as soon as possible. Failure to do so could legally be determined to be lack of proper maintenance of your vehicle. Also, your vehicle may fail a state or local emission inspection if this recall is not accomplished. The California Air Resources Board (CARB) requires vehicle emission recalls be completed prior to California registration renewal. Uncorrected emission recalls will result in the inability to renew your California vehicle registration. At the time of emission recall completion, your California dealer will issue a "Proof of Correction Certificate". Keep this certificate and, if required, present it to the Department of Motor Vehicles when renewing your California registration as proof of recall completion. Notice that important line "Failure to do so could legally be determined to be lack of proper maintenance of your vehicle.". A line that isn't in a Safety recall notice. This situation has changed after the first three weeks of the recall. The GM system is showing the required seal kit as being out of stock. Orders will backorder. Dealerships should place CSO orders for the parts required for customers. And follow up with GM TRACS or EPIC for information as to expected availablilty. There has also been a shortage of the rear differential lubricant in the quart bottles, and Limited Slip additive, from time to time. Best to check with your dealership that all parts are available before bring a car in for the recall, or perhaps any service. Are there other parts required? Two possible additional parts, depending on the procedures used and the configuration of the car. First situation would be if the dealership drops the exhaust to perform the procedure. There have been reports from some of the early recalls that the studs from the catalytic converter to exhaust have required replacement. Currently both the 2006-2007 2.4L and 2007 2.0L show the same part number for these studs, 12562640. These are tricky ones. The parts book lists them as beign part of the converter. Dig around and will see that they are available seperately. The second additional part is for cars that have a 4-bolt mounting bracket attached to the rear differential. These cars would include the 2007 Solstices with manual transmission and the driveline support bracket. This would be all GXPs and base Solstices built after the introduction of the support. The bolts required are #11515768. When you are making your appointment, make sure that these are in stock in your car requires them. UPDATE: GM has issued 07-204D, or the fifth revision to the procedure. This version now recognizes the need for the 4 bracket bolts. Last edited by Small Dealer; 06-21-2008 at 08:06 AM. For those of you not taking this too seriously, you should get it fixed asap. I had my dif seal "repaired" by my local GMC dealership in Oct. I began leaking again in Jan and making noises, I had an appt to get it fixed again on Friday and a few days before on Jan 22 my wheels locked during a downhill turn at 45 and I ate a grove of trees. The car kept me safe aside from some whiplash, but the wreck caused over 9700 worth of damage to my poor baby, she is STILL in the shop and probably will be till next month.....I got the recall paper in the mail a week and a half AFTER my wreck.....timing is everything. Toys aren't just for boys! ; ) Her name is NOTIE=NAUGHTY and she gets me into all sorts of wonderful trouble! 2006 Solstice, Silver, with 20" Nitrous FOOSE wheels & Nito racing tires. I have just over 8k miles on my GXP. I've never seen any sign of a leak and no noise from my diff. I'm really leery about having having this service done. I've read over the years how people have had to repeatedly have repair done on their diff. I'm I crazy for ignoring this recall? Ordered 06/24/06, built 01/04/07, delivered 01/20/07. I don't know the original poster, but I know 07Bluestone personally (see post #18 in the thread), and I believe he is intelligent and knowledgeable enough not to be taken in by a BS story from his dealer. Okay, so I've made the appointment for next week. All the comments about leaking without actually making it to the garage floor got to me. Now I just have to make sure my car actually starts this weekend. Either 1. there is evidence of a leak or 2. gm did not add enough fluid, which wouldn't surprise me at all. Still not taking my non-leaker in for the recall. Both options have me concerned enough to take mine in. Mine will be at the dealer tomorrow for the recall, with a complete drain and refill of the diff being done as well. I guess I'd better crawl under it this weekend and check. I've got some Amsoil diff lube and additive I'm been meaning to put in it. Can I assume the dealer will refuse to use it instead of the stock stuff if I take it in for the recall? There was a bunch of posts and discussion about parts availability for this recall. Thought everyone would be interested in these numbers. GM reported to the NHTSA that in the first two months of the recall (announced February 1st, and the Quarter End of March 31st), that of the 274,173 total vehicles, 552 were inspected and required no repairs and 108,908 were inspected and repaired, or about 40%. 108,908 is a lot of kits.